The event has seen the participation of the Peruvian Defence Minister, Pedro Cateriano Bellido, the Commander in Chief of the Peruvian Air Force - General Dante Arévalo Abate, the Italian Defence Minister, Roberta Pinotti, the Italian Ambassador in Lima, Mauro Marsili, and the Alenia Aermacchi’s Vice General Manager, Massimo Ghione. This aircraft is part of the contract signed between Alenia Aermacchi and the FAP in December 2013. In December 2014 a second contract was signed for two additional C-27Js bringing to four aircraft the number of these planes ordered by the Peruvian Air Force (FAP). The airplanes’ deliveries will end in 2017 and will be managed by the Air Group n. 8 at the Callao base, on the central coast of the Country. The C-27J has been selected thanks to is capability of operating safely and efficiently and at competitive costs in all operational scenarios of this Latin American Country, including activities on semi-prepared airstrips of the Andes and of the many local airports, at high altitudes and with hot weather, said Alenia. The FAP will employ the C-27J as a strategic asset in passenger and cargo transport, humanitarian, fire-fighting, search and rescue and internal security missions. 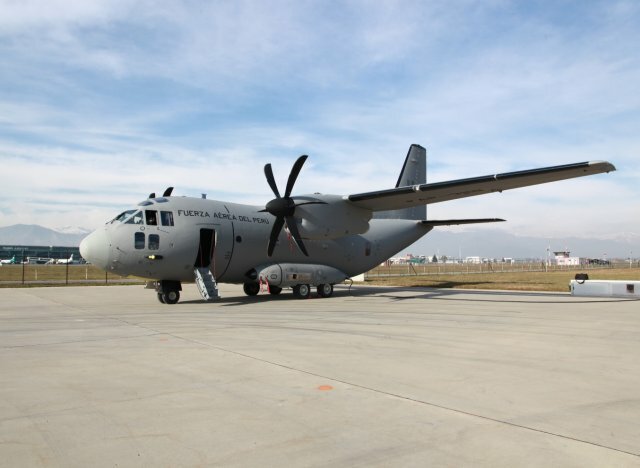 In addition to Peru the C-27J Spartan has already been ordered by the Air Forces of Italy, Greece, Bulgaria, Lithuania, Romania, Morocco and Slovakia, as well as by the U.S., Mexico, Australia and by an African Country, for a total of 80 airplanes.